A truck has as its intended purpose that of providing its owner with the opportunity of carrying or moving a payload from point of origin to an intended destination. A book does something similar, transporting its reader from point of origin or initial setting through the twists and turns of plot through to a closing destination. The cargo is human in imagination’s resemblance and there is something the author proposes to be learned/understood as one participates in the book’s movement of mind to its conclusion and denouement. This Vavenby, British Columbia truck does have me consider how it was used and the peoples and cargos it has transported. I appreciate its owner having given me permission to photograph it – thank you, Marvin Ritchie. The photographic respite you allowed helped make the long westward drive more doable. Listening to – U2’s With or Without You, Mysterious Ways and Elevation (as viewed from the Live at Boston DVD). Nice, good composition. I like the way the light travels across the picture. 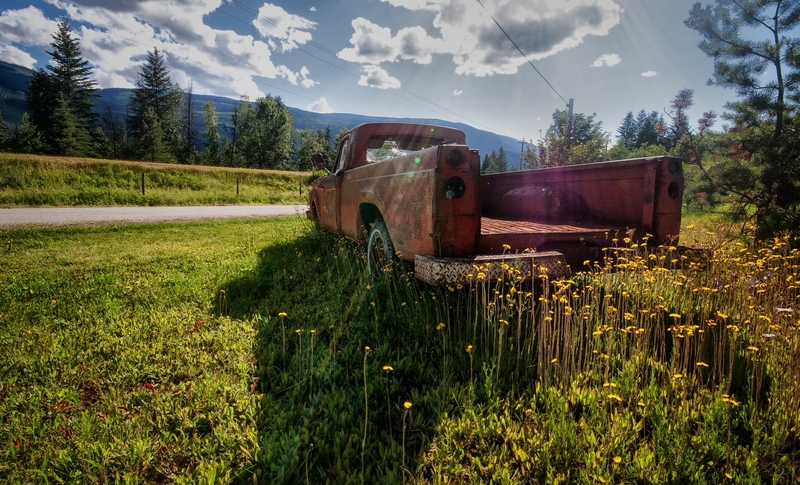 The truck and the light and the colours draw me to this photograph.